The Jack Snipe is smaller and shorter-billed than most of other snipes. With some morphological and behavioural differences, it is classified in its own genus Lymnocryptes. This species usually occurs in thick marsh vegetation. It is very secretive and its cryptic plumage makes it invisible on the ground. During the breeding season, the male performs high aerial displays to advertise its large territory. 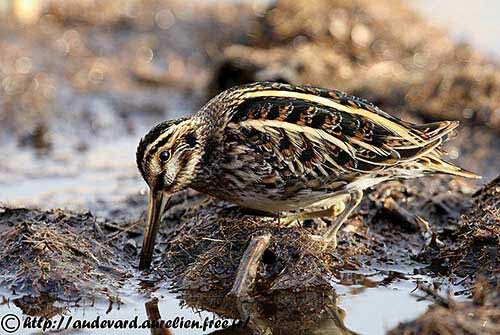 The Jack Snipe is migratory and breeds in N Europe and N Russia, but the wintering areas are widely scattered from British Islands through W Europe and S to tropical Africa and some parts of S Europe and Asia. This species is not globally threatened and has fairly stable population. The Jack Snipe adult has brownish-black mantle, upper scapulars, rump and uppertail, with strong purple and green gloss. Four conspicuous pale golden-buff parallel lines contrast strongly with the dark areas. The lower scapulars are mostly dark brown with reddish-buff and pale buff markings. On the upperwing, the coverts are brown with pale buff fringes. The flight feathers are dark brown with narrow white tips to secondaries and inner primaries, like greater coverts and greater primary coverts. The wedge-shaped tail is dark brown with darker centre. It is composed of six pairs of pointed rectrices. On the underparts, neck, breast and anterior flanks are washed and streaked brown. Rest of underparts are whitish, but the undertail is slightly streaked brown. Underwing and axillaries are pale greyish-white with weak brown streaking. On the head, unlike other snipes, the crown lacks the pale central stripe, and is blackish-brown with pale flecks. We can see a double buffy-white supercilium that encloses a shorter blackish stripe above the eye. Lores are blackish and a dark eye stripe continues behind the eye and joins a dark spot on the lower ear-coverts. There is a more indistinct dark line across the lower cheeks. Rest of face, chin and throat are buffy-white, whereas the hindneck is mottled brown or grey-brown with paler flecks. The relatively short bill (36-43 mm) is dull pinkish-brown to yellowish at base, with blackish terminal third towards the tip. The eyes are dark brown. Legs and feet are pale greenish or dull greenish-yellow to dull pinkish-brown. Male and female are similar, with longer wings and tail in male. The juvenile resembles adults but with white undertail-coverts and smaller and paler brown stripes above. The Jack Snipe breeds from NE Scandinavia to E Siberia. There are some isolated populations in S Sweden, N Poland, N Belarus and sometimes in Baltic States. It winters from British Islands S through W Europe and Mediterranean to N Afrotropics, and E through Asia Minor, Middle East, Azerbaijan, Iran, Afghanistan and India, to S China and Vietnam. 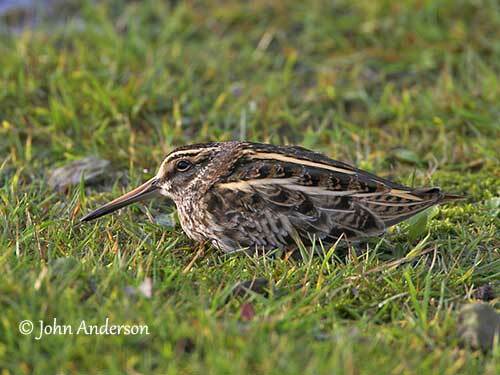 The Jack Snipe breeds in boreal forest in large wet bogs and in areas of bushy tundra. Outside breeding season, it can be seen in a variety of brackish and freshwater habitats including marshes, wet meadows, flooded fields and grassy areas near pools and lakes, usually with soft silty mud. The Jack Snipe is often silent when flushed, or rarely gives a weak “gah”. However, it becomes noisy during the breeding season. During the flight displays, it gives first a regular knocking “ogogogogogogog…” during five seconds, followed by a quicker sound similar to a galloping horse “ogogoglK-ogoglK…” lasting eight seconds, and finally a rhythmical series of high-pitched whistles “whirble-eeble-eeble-eeble…” during six seconds. The Jack Snipe feeds on earthworms, insects (adults and larvae), freshwater and terrestrial small molluscs, and sometimes grass and seeds. It forages mainly at dusk or by night. It probes in mud with the bill, or picks up prey items from the surface. While foraging, it performs a remarkable up-and-down rhythmical bouncing action. The reason of this behaviour is currently unknown. It usually feeds singly or in small, loose groups of 4-5 birds. 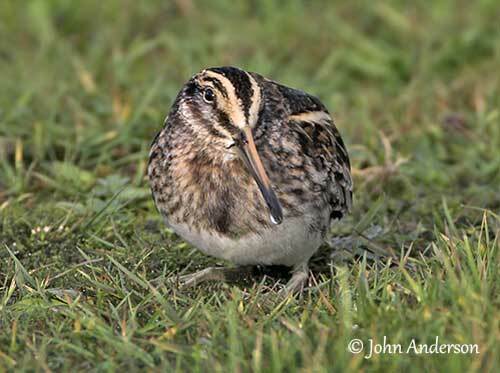 The Jack Snipe uses its cryptic plumage and adopts an effective camouflage posture by flattening against the ground just in front of an advancing human. The pale lines of the upperparts are aligned with the vegetation, making the bird almost invisible. The bird may flush at less than 1 metre, and some birds can be stepped or captured by hand. 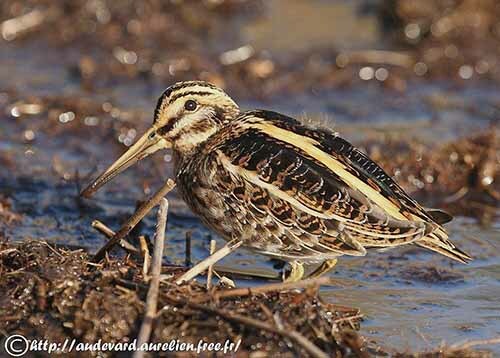 During the breeding season, the Jack Snipe male holds a large territory of several hectares (up to 20 ha). The high aerial display is an advertising territorial behaviour. This display is performed at dawn and dusk, and sometimes during the day. The bird rises from the ground until 50-60 metres high at angle of 45/50°. Then, it flies in straight line or in wide circles, and dives steeply at similar angle, often rolling over with half-folded wings before zooming upwards again. The “galloping horse” song can be heard during this flight. This species is usually monogamous. 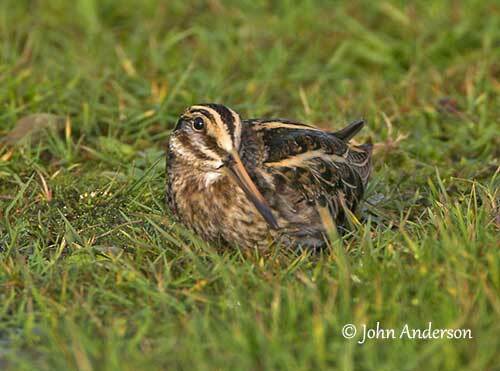 The Jack Snipe is migratory, but adults and young moult in August/September, in or close to their breeding areas. Then, they move SW across Europe between mid-September and mid-November. They reach their non-breeding areas from October, but mainly from November in tropics. The return occurs from March to mid-April, and they reach their breeding grounds between mid-April and mid-May, mostly late May in Siberia. Unlike other snipes that fly in zigzag, the Jack Snipe has direct flight with rapid wingbeats. When flushed, it rises from almost underfoot, fluttering-up with some hesitant wingbeats, and usually dropping after a short distance. The breeding season occurs from May to early September. The Jack Snipe nests in a well-hidden site, on floating bogs or on drier ground among the vegetation. The nest is a shallow depression lined with grass and leaves. The female lays 3-4 olive/brownish eggs with dark markings. She incubates during 24 days. The chicks are a darker version of the adults. They are precocial and able to walk very soon after hatching. Both parents tend the young which fledge about three weeks after hatching. They become independent a few days later. This species may produce two broods per season. The Jack Snipe is threatened by habitat loss, through degradation of wetland habitats. It also suffers from hunting pressure during autumn migration, and from lead poisoning in wetlands. The overall population trend is stable, and the global population is estimated to number 1,000,000 individuals (2006). The Jack Snipe is currently evaluated as Least Concern.